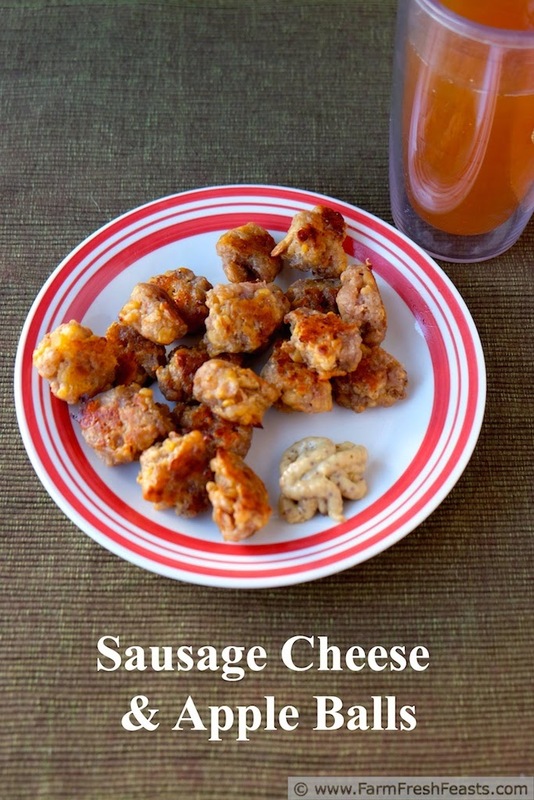 A blend of Italian and breakfast sausages with cheese and apple in a bite-size appetizer. With Fall comes an increase in my kids' busy schedules. Marching band, sled hockey and sewing all happen in the evenings and that means sometimes dinner is actually Substantial Afternoon Snack. A snack like this, with some apple slices, veggies and hummus, and a glass of milk or cider is enough for my kids to fuel up and power through the rest of a long day. When I set a goal of increasing my vegetable appetizer recipes on the blog at the beginning of this year, I deliberately concentrated on appetizers that don't use meat. Participating in #AppetizerWeek added a bunch to get the ball rolling [goodness, pun was not initially intended but I'm going with it] and I've added some each month. 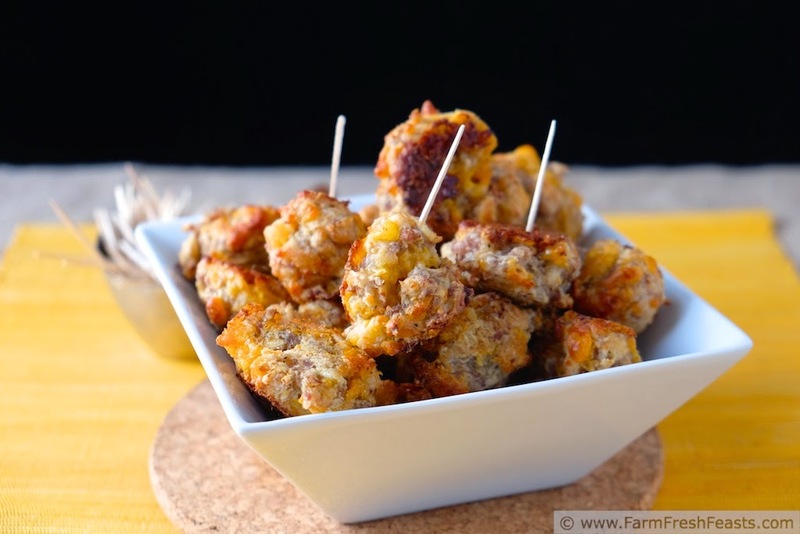 I'm going to broaden this list to include some meat-containing appetizers, starting with these Sausage Cheese Apple Balls. I made these first while preparing to host a bunch of fellow military spouses, and I was ridiculously distracted in the preparation. I'm so grateful that Joyce arrived, said 'can I do anything to help?' and took over the baking that night. Because the recipe makes a ton, I froze half of the dough. My son baked them later for a snack and I took some photos. Well, those photos fell into the swamp didn't turn out, so I made up another batch and tweaked it a bit. I now prefer a blend of breakfast and Italian sausage for our snacks. Just like reading the same words over and over can improve fluency, preparing the same recipes over and over can help with cooking skills. My son is learning to cook by mastering one recipe at a time. 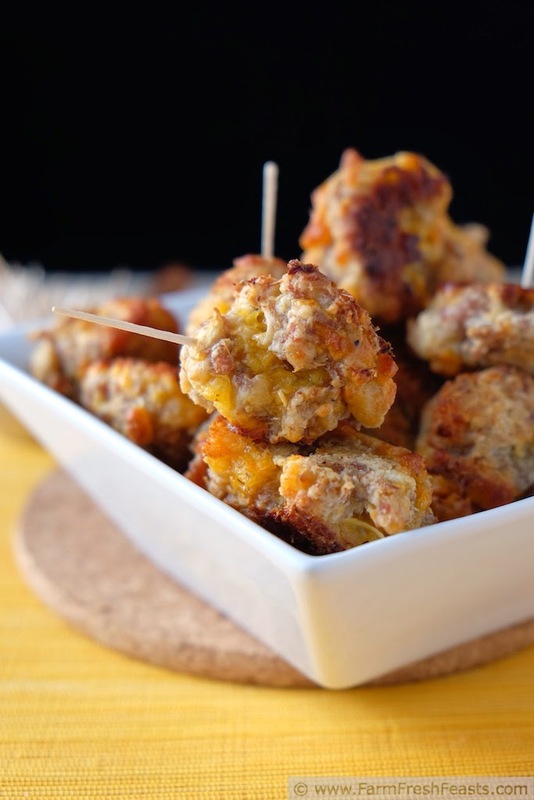 Since he loves the classic Bisquik Sausage Cheese Balls it was easy to get him interested in making them again, with a twist. As Lydia commented on my Cheddar Apple Soaked Multigrain Muffins, apple pie and cheddar cheese go very well together, so I figured adding grated apple would work in these appetizers. 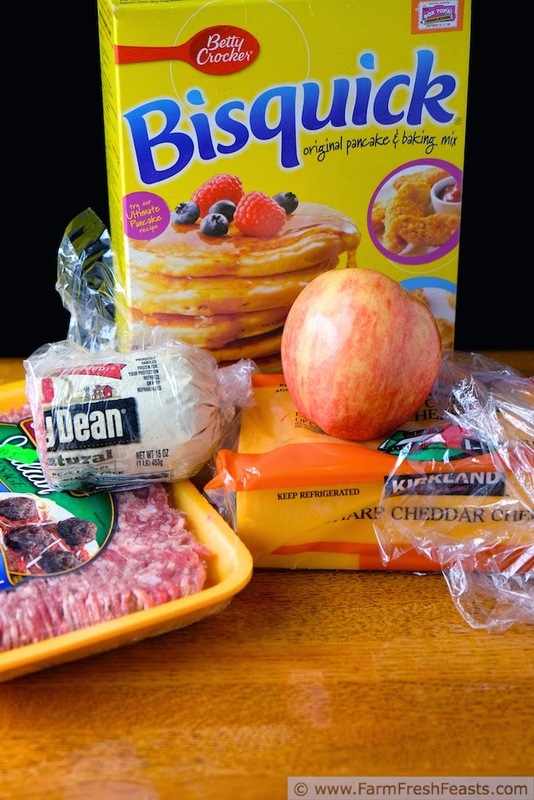 This recipe is so simple to throw together, even a teen can make it! For more recipes using apples, please see my Apple Recipes Collection, part of the Visual Recipe Index by Ingredient. For more appetizer ideas, please see my Pinterest boards. Want to know how to use this blog? Click here. Note: This recipe makes a bunch--so I usually portion the dough out into 2 cup amounts and freeze them in bags. That way we can enjoy a snack without eating too many balls. I take the bag out to thaw the day before I want to serve, and continue baking as directed. You could probably freeze the individual balls on a tray, store in a bag, and cook from frozen. I would add at least 3 to 5 minutes to the baking time (cook for 15 minutes on one side, then flip and cook for at least another 15 minutes). Preheat oven to 350 degrees Fahrenheit. Place a piece of parchment paper on a rimmed baking sheet. In a large bowl, combine all ingredients using a spoon, or with the paddle attachment in a stand mixer. With moistened fingers, shape about a half Tablespoon worth of dough into a rough square. [I was going for a Starburst Candy shape and failed.] Place on prepared pan. Bake 10 minutes, then flip over--see why I was going for the flat sides?--and bake for another 10 to 15 minutes until browned. 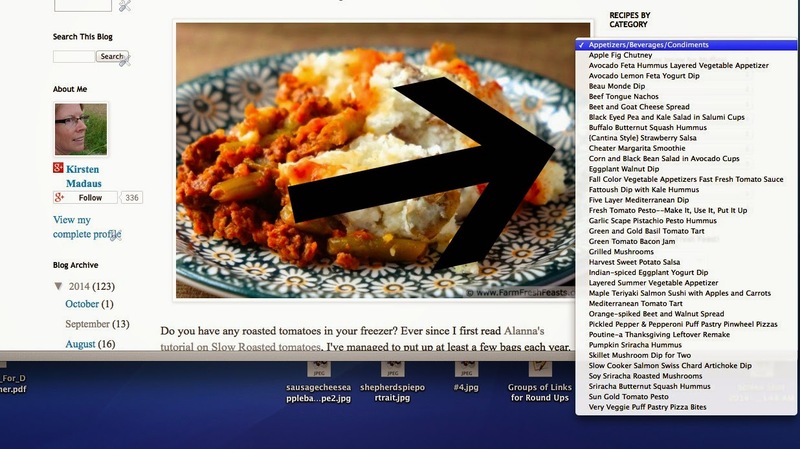 The sheer amount of recipes you have is staggering, in a good way. Yes to apples and cheese. They are a match made in heaven. Ha! If you think this is a lot of recipes . . . well, it staggers me to think of others who have been doing this longer! I have a new apple+cheese combo for you. I turned your apple gouda grilled cheese into a pizza. Yum. Well I have made the Sausage and Cheese balls before but I've never tried it with apples, this sounds like a great idea. Thank you for sharing with the Clever Chicks Blog Hop! I hope you’ll join us again next week! These sound delicious Kirsten. 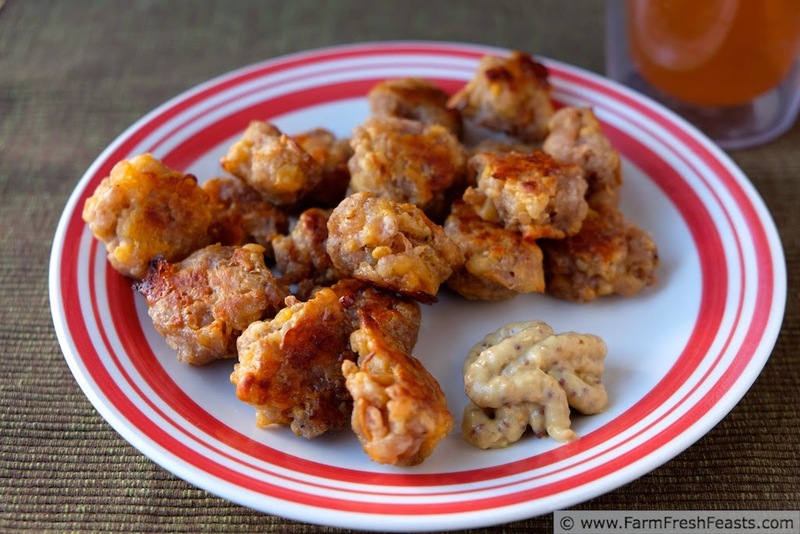 Perfect for the holidays or snacking during game time. Thanks for sharing. 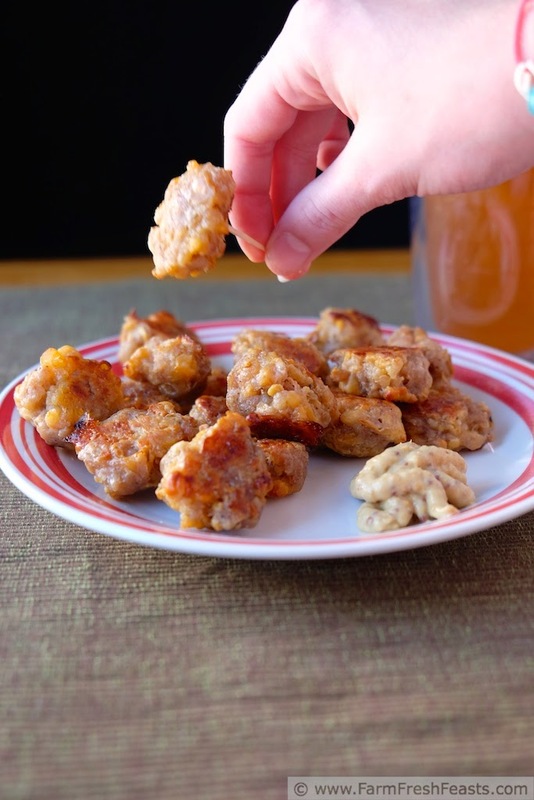 I'm glad to have an assortment of appetizers handy, and having a bag of this mix in the freezer means I can whip up a small amount whenever I need. Thanks! Woot! I made it to a short list! I love sausage and apples:) Adding cheese is just a bonus lol Thank you for the recipe....I'll use this soon! Apples and cheese, along with popcorn, are a favorite movie snack-for-dinner. Adding in sausage to this mix just makes sense--and since it freezes, we can pull this out for appetizers any time.